China is the largest producer and consumer of coal in the world and is the largest user of coal-derived electricity. The share of coal in the energy mix has declined during the 2010s, falling from 80% in 2010 to 60% in 2017. Domestic coal production has also decreased with a year on year decline of 9% in 2016. However, imports of coal have increased to compensate for the cuts to domestic coal production. Overall electricity consumption has continued to rise. The rise in demand for electricity has meant the continued construction of new coal fired power plants. To curtail the pace of coal fired power plant construction, National Energy Administration in January 2017 canceled coal fired power plant permits that would have amounted to 120 GW of future capacity. However, local authorities seeking to create jobs have resisted the efforts of central authorities to cut back. Based on analysis of satellite photos in 2018, environmental NGO CoalSwarm claims that 259 GW of new coal power plant capacity is under construction including plants that central authorities had canceled, postponed or slowed down. As of the end of 2014, China had 62 billion tons of anthracite and 52 billion tons of lignite quality coal. China ranks third in the world in terms of total coal reserves behind the United States and Russia. Most coal reserves are located in the north and north-west of the country, which poses a large logistical problem for supplying electricity to the more heavily populated coastal areas. At current levels of production, China has 30 years worth of reserves. Production of coal within China by type. For reference: GDP of the PRC. Coal production and usage demonstrates a hypersensitivity to economic changes. Coal is the main source of energy in China. In 2011 the Chinese coal production was equivalent to 3,576 Mt × 0.522 toe/t × 11.630 MWh/toe = 21,709 TWh. Assuming the same caloric value for the imported coal the net coal energy available would be evaluated as 22,784 TWh. Assuming imported coal equal to domestic one, available coal (IEA) was about 17,000 TWh in 2008 and 22,800 TWh in 2011, with increase of 5,800 TWh in three years. Total renewable energy in China was 3,027 TWh in 2008 and 2,761 TWh in 2005, with increase of 266 TWh in three years. Same period from 2005 to 2008 annual coal use increased 3,341 TWh. Energy demand in China continues to increase, with electric demand roughly doubled to 2013, The demand for coal in China had increased so fast, demand had exceed production due to factors such as a government crackdown on mines that are unsafe, polluting, or wasteful. Some were shut down for the 2008 Summer Olympics. On July 6, 2008 in central and northern China, 2.5% of the nation's coal plants (58 units or 14,020 MW of capacity) had to shut down due to coal shortages. This forced local governments to limit electricity consumption and issue blackout warnings. The shortage is somewhat attributed to the closing of small dangerous coal mines. In 2011, seven Chinese coal mining companies produced 100 million metric tonnes of coal or more. These companies were Shenhua Group, China Coal Group, Shaanxi Coal and Chemical Industry, Shanxi Coking Coal Group, Datong Coal Mine Group, Jizhong Energy, and Shandong Energy. The largest metallurgical coal producer was Shanxi Coking Coal Group. In 2015, official statistics revealed that previous statistics had been systematically underestimated by 17%, corresponding to the entire CO2 emissions of Germany. A coal mine near Hailar. 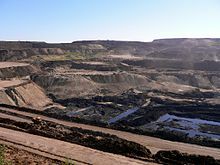 China's largest open-pit coal mine is located in Haerwusu in the Inner Mongolia Autonomous Region. It started production on 20 October 2008, and is operated by Shenhua Group. Its estimated coal output was forecast at 7 million tonnes in the fourth quarter of 2008. With a designed annual capacity of 20 million tonnes of crude coal, it will operate for approximately 79 years. Its coal reserves total about 1.73 billion tonnes. It is rich in low-sulfur steam coal. Mines in Inner Mongolia are rapidly expanding production, with 637 million tons produced in 2009. Transport of coal from this region to seaports on China's coast has overloaded highways such as China National Highway 110 resulting in chronic traffic jams and delays. China's coal consumption in 2010 was 3.2 billion metric tonnes per annum. The National Development and Reform Commission, which determines the energy policy of China, aims to keep China's coal consumption below 3.8 billion metric tonnes per annum. During the first three quarters of 2009 China's coal consumption increased 9% from 2008 to 2.01 billion metric tons. The consumption of coal is largely in power production, aside from this, there is a lot of industry and manufacturing use along with a comparatively very small amount of domestic use. Coal power is distributed by the State Power Grid Corporation. China's installed coal-based electrical capacity was 907 GW, or 77% of the total electrical capacity, in 2014. The dominant technology in the country is coal pulverization in lieu of the more advanced and preferred coal gasification. China's move to a more open economy in the 1990s is cited as a reason for this, where the more immediately lucrative pulverization technology was favored by businesses. There are plans in place for an Integrated Gasification Combined Cycle (IGCC) type plant by 2010. Furthermore, less than 15% of plants have desulphurization systems. China's energy consumption is mostly driven by the industry sector, the majority of which comes from coal consumption. One of the principal users is the steel industry in China. Coal for domestic use (honeycomb briquettes) being transported by use of a tricycle, 1997. In cities the domestic burning of coal is no longer permitted. In rural areas coal is still permitted to be used by Chinese households, commonly burned raw in unvented stoves. This fills houses with high levels of toxic metals leading to bad Indoor Air Quality (IAQ). In addition, people eat food cooked over coal fires which contains toxic substances. Toxic substances from coal burning include arsenic, fluorine, polycyclic aromatic hydrocarbons, and mercury. Health issues are caused which include severe arsenic poisoning, skeletal fluorosis (over 10 million people afflicted in China), esophageal and lung cancers, and selenium poisoning. In 2007 the use of coal and biomass (collectively referred to as solid fuels) for domestic purposes was nearly ubiquitous in rural households but declining in urban homes. At that time, estimates put the number of premature deaths due to indoor air pollution at 420,000 per year, which is even higher than due to outdoor air pollution, estimated at around 300,000 deaths per year. The specific mechanisms for death cited have been respiratory illnesses, lung cancer, Chronic Obstructive Pulmonary Disease (COPD), weakening of the immune system, and reduction in lung function. Measured pollution levels in homes using solid fuels generally exceeded China's IAQ air quality standards. Technologies exist to improve indoor air quality, notably the installation of a chimney and modernized bioenergy but need more support to make a larger difference. China became a net importer of coal in 2008. In 2006, its exports exceeded imports by 25.1 million tons, but only by 2 million tons in 2007. This is significantly lower than the 90 million ton net exports in 2001. Australia is the largest supplier of coal to China. It is believed that a continued increase in coal power in China may undermine international initiatives to decrease carbon emissions such as the Kyoto Protocol, which called for a decrease of 483 million tons by 2012. In the same time frame, it is expected that coal plants in China will have increased CO2 emissions by 1,926 million tons — over 4 times the proposed reduction. Air pollution in China kills 750,000 people every year, according to a study by the World Bank. Issued in response to record-high levels of air pollution in 2012 and 2013, the State Council's September 2013 Action Plan for the Prevention and Control of Air Pollution reiterated the need to reduce coal's share in China's energy mix to 65% by 2017. Amidst growing public concern, social unrest incidents are growing around the country. For example, in December 2011 the government suspended plans to expand a coal-fired power plant in the city of Haimen after 30,000 local residents staged a violent protest against it, because "the coal-fired power plant was behind a rise in the number of local cancer patients, environmental pollution and a drop in the local fishermen's catch." In addition to environmental and health costs at home, China's dependence on coal is cause for concern on a global scale. Due in large part to the emissions caused by burning coal, China is now[when?] the number one producer of carbon dioxide, responsible for a full quarter of the world's CO2 output. According to a recent[when?] study, "even if American emissions were to suddenly disappear tomorrow, world emissions would be back at the same level within four years as a result of China’s growth alone." The country has taken steps towards battling climate change by pledging to cut its carbon intensity (the amount of CO2 produced per dollar of economic output) by about 40 per cent by 2020, compared to 2005 levels. Reuters reports that "emissions and coal consumption will continue to rise through the 2020s, even though at a slower rate, barring a major intervention including a shift to cleaner burning gas from coal" - in other words, "meeting the carbon intensity target will require a significant change in trajectory for carbon emissions and coal consumption." To that end, China has announced a plan to invest 2.3 trillion yuan ($376 billion) through 2015 in energy saving and carbon emission-reduction projects. China's first coal-fired power station employing the integrated gasification combined cycle (IGCC), which is a coal gasification process that turns coal into a gas before burning it, is planned to begin operations in 2009 at Tianjin near Beijing. Developed under a project called GreenGen, this $5.7 bn 650 MW plant will be a joint venture between a group of state-owned enterprises and Peabody Energy. In addition to these coal gasification projects, it is worth noting that on average, China's coal plants work more efficiently than those in the United States, due to their relative youth. In September 2011, the Chinese government's Ministry of Environmental Protection announced a new emission standard for thermal power plants, for NOx and mercury, and a tightening of SO2 and soot standards. New coal power plants have a set date of the beginning of 2012 and for old power plants by mid-2014. They must also abide by a new limit on mercury by beginning of 2015. It is estimated such measures could bring about a 70% reduction in NOx emissions from power plants. In 2012, industrial conglomerate China Wanxiang Holdings signed a $1.25 billion deal with American company GreatPoint Energy to build a large-scale plant using GreatPoint's catalytic hydromethanation process of coal gasification. The technology converts coal into natural gas and enables the recovery of contaminants in coal, petroleum coke and biomass as useful byproducts. Most importantly, nearly all of the CO2 produced in the process is captured as a pure stream suitable for sequestration or enhanced oil recovery. The total project will cost an estimated $20 – 25 billion and will supply a trillion cubic feet of natural gas. This represents a massive leap in the scale of domestic production for China, which last year produced only 107 billion cubic feet of natural gas. The deal includes an equity investment of $420 million, the largest ever by a Chinese corporation into a venture-capital-funded U.S. company, according to industry tracker VentureSource. China is the first country with a single party government structure to take steps towards developing a nationwide Emissions Trading System. China decided to close the last four coal-fired power and heating plants out of Beijing's municipal area, replacing them with gas-fired stations, in an effort to improve air quality in the capital. The four plants, owned by Huaneng Power International, Datang International Power Generation Co Ltd, China Shenhua Energy and Beijing Jingneng Thermal Power Co Ltd, had a total power generating capacity of about 2.7 gigawatts (GW). All of them have been closed as of March 2019. It is estimated that coal mine fires in China burn about 200 million kg of coal each year. Small illegal fires are frequent in the northern region of Shanxi. Local miners may use abandoned mines for shelter and intentionally set such fires. One study estimates that this translates into 360 million metric tons of carbon dioxide emissions per year, which is not included in the previous emissions figures. North China's Inner Mongolia Autonomous Region has announced plans to extinguish fires in the region by 2012. Most of these fires were caused by bad mining practices combined with bad weather. 200 million yuan (29.3 million USD) has been budgeted to this effect. In 2003, the death rate per million tons of coal mined in China was 130 times higher than in the United States, 250 times higher than in Australia (open cast mines) and 10 times higher than the Russian Federation (underground mines). However the safety figures in the major state owned coal enterprises were significantly better. Even so, in 2007 China produced one third of the world's coal but had four fifths of coal fatalities. It is also important to mention that China's coal mining industry resorts to forced labor according to a 2014 U.S. Department of Labor report on child labor and forced labor around the world, and that these workers are all the more exposed to the dangers of such activities. Disability-adjusted life year for chronic obstructive pulmonary disease per 100,000 inhabitants in 2004. While not directly attributable, many more deaths are resultant from dangerous emissions from coal plants. Chronic obstructive pulmonary disease (COPD), linked to exposure to fine particulates, SO2, and cigarette smoke among other factors, accounted for 26% of all deaths in China in 1988. A report by the World Bank in cooperation with the Chinese government found that about 750,000 people die prematurely in China each year from air pollution. Later, the government asked the researchers to soften the conclusions. Many direct deaths happen in coal mining and processing. In 2007, 1,084 out of the 3,770 workers who died were from gas blasts. Small mines (comprising 90% of all mines) are known to have far higher death rates, and the government of China has banned new coal mines with a high gas danger and a capacity below 300,000 tons in an effort to reduce deaths a further 20% by 2010. The government has also vowed to close 4,000 small mines to improve industry safety. A total of 2,657,230 people worked in state owned coal mines at the end of 2006. As of 2009, the government has been cracking down on unregulated mining operations, which in 2009 accounted for nearly 80 percent of the country's 16,000 mines. The closure of about 1,000 dangerous small mines in 2008 helped to cut in half the average number of miners killed, to about six a day, in the first six months of 2009, according to the government. Major gas explosions in coal mines remain a problem, though the number of accidents and deaths have gradually declined year by year, the chief of the State Administration of Work Safety, Luo Lin, told a national conference in September 2009. In the first nine months of 2009, China's coal mines had eleven major accidents with 303 deaths, with gas explosions the leading cause, according to the central government. Most accidents are blamed on failures to follow safety rules, including a lack of required ventilation or fire control equipment. Unofficial estimates often estimate death tolls at twice the official number reported by the government. Since 1949 over 250,000 coal mining deaths have been recorded[when?]. However, since 2002, the death toll is gradually declining while the coal production is rapidly rising, doubling over this same period[when?]. In October 2008, Greenpeace, World Wildlife Fund, and The Energy Foundation published The True Cost of Coal, a report that said that by-products of coal burning such as water pollution, air pollution and human costs such as mining deaths are costing China an additional 1.7 trillion yuan per year, or more than 7% of GDP. They recommended that China increase the price of coal by a tax of 23% to reflect the true costs of China's reliance on coal. Other commentators have pointed out that China has been taking a role as a leader in making use of coal as an electricity source more clean and responsible. For instance, the country built new ultra-supercritical coal plants (~44% efficiency) before the United States. Chinas coal fleet has currently (2017) an average efficiency of 38.6% compared to the US with 37.4%. . In 2009, China required companies building new plants to retire an old plant for every new one built. In 2015, an IMF study showed that China has the largest cost of air pollution effects in the world. ^ a b "China's annual coal consumption rises for first time in 3 years". Financial Times. ^ "Satellite images show 'runaway' expansion of coal power in China". The Guardian. September 26, 2018. ^ a b c Cohen, Armond (April 21, 2014). "Learning from China: A Blueprint for the Future of Coal in Asia?". The National Bureau of Asian Research. Retrieved August 8, 2014. ^ "Nuclear Power in China". Country Briefings. World Nuclear Association. 31 July 2010. Retrieved 2010-08-04. ^ "Country analysis briefs: China". Energy Information Administration. August 2006. Retrieved 2008-07-02. ^ Jane Perlez and Yufan Huang (16 December 2015). "Mass Layoffs in China's Coal Country Threaten Unrest". The New York Times. Retrieved 17 December 2015. The coal industry is hurting nationwide, as coal prices have fallen nearly 60 percent since 2011, said Deng Shun, an analyst at ICIS C1 Energy, a consultancy based in Shanghai. ^ "China 2017 raw coal output up 3.2pct, Dec figure at 24-mth high". www.sxcoal.com. Retrieved 2018-07-03. ^ The Age. China coal shortage to continue. January 16, 2008. ^ Bloomberg. China Shuts More Coal Power Plants; Warns on Shortage (Update1). June 8, 2008. ^ "China's 7 Coal Mining Companies Realized Production Capacity of 100 Mln Tonnes in 2011". China Mining Association. 2012-02-01. Retrieved 2012-06-03. ^ Le, Reggie (2012-04-05). "China's Jizhong Energy mines 31 million mt of coal, up 10% on year". Platts. Retrieved 2012-06-03. ^ Buckley, Chris (3 November 2015). "China Burns Much More Coal Than Reported, Complicating Climate Talks". Retrieved 13 October 2017 – via www.nytimes.com. ^ "China's largest open-pit coal mine ready for production". Xinhua News Agency. October 19, 2008. Retrieved 2010-08-04. ^ Jin, Tony (October 27, 2009). "China Consumes 9% More Coal through September". The China Perspective. Retrieved 2010-08-04. ^ "Coal and Peat in China, People's Republic of in 2007". International Energy Agency (IEA). Retrieved 2010-08-04. ^ Other Transformation refers to an energy transformation process not in the preceding list of electricity, industry, or heat. For the case of coal, this is likely to include losses, own use, gains, or liquefaction. Reference: . ^ "Coal is losing its market share in China's electricity generation - Market Realist". marketrealist.com. Retrieved 13 October 2017. ^ Technology Review. Part II: China's Coal Future, "To prevent massive pollution and slow its growing contribution to global warming, China will need to make advanced coal technology work on an unprecedented scale." ^ Wikinvest:China's Coal Power Pollution. ^ Ma, Damien. "China's Coming Decade of Natural Gas". Asia's Uncertain LNG Future. November 2013. Retrieved 8 August 2014 from http://www.nbr.org/publications/element.aspx?id=711. ^ Robert B. Finkelman, Harvey E. Belkin, and Baoshan Zheng. Health impacts of domestic coal use in China. Proc Natl Acad Sci U S A. 1999 March 30; 96(7): 3427–3431. ^ Environmental Health Perspectives. Household Air Pollution from Coal and Biomass Fuels in China: Measurements, Health Impacts, and Interventions. Received July 3, 2006; Accepted February 27, 2007. ^ "Subscribe to read". Financial Times. Retrieved 13 October 2017. ^ "China drives world carbon emissions to record high". 21 September 2014. Retrieved 13 October 2017 – via Reuters. ^ The Christian Science Monitor. New coal plants bury 'Kyoto'. December 23, 2004. ^ "Country analysis briefs: China". Energy Information Administration. August 2006. Retrieved 2008-07-11. ^ "China's first carbon capture & storage plant to be operational by 2009". Power Engineering International. 2007-12-31. Retrieved 2008-01-13. ^ "Chinese government demand coal companies begin to pay for bad air". Greenpeace East Asia. 2011-09-26. Retrieved 2011-09-26. ^ Chen, Kathy; Tom Miles (22 May 2015). "Beijing promises coal-free power by 2017 to fight pollution". Reuters. Retrieved 2015-11-25. ^ Mines and Communities Website. A Burning Issue. February 14, 2003. ^ "List of Goods Produced by Child Labor or Forced Labor". www.dol.gov. Retrieved 13 October 2017. ^ Financial Times. 750,000 a year killed by Chinese pollution. July 2, 2007. ^ Xinhua. China to ban small coal mines for improving pit safety record. August 15, 2008. ^ International Energy Agency. Cleaner Coal in China. Copyright 2009. ^ a b "42 Reported Dead, and 66 Trapped, in China Mine Accident" by the Associated Press, via The New York Times. November 21, 2009. Retrieved 2009-11-21. ^ World Socialist Website. China’s coal mining deaths spiral. August 3, 2002. ^ "20 Die in Coal Mine Plunge - China Digital Times (CDT)". 25 September 2012. Retrieved 13 October 2017. ^ Mines and Communities Website. China and US coal disasters. 7th January 2006. ^ Greenpeace web site. China's Coal Crisis. October 27, 2008. ^ "Technology Frontier Article" (PDF). Retrieved 13 October 2017. ^ Power Magazine. . August 21, 2017. ^ The New York Times. China Outpaces U.S. in Cleaner Coal-Fired Plants. May 10, 2009. ^ "IMF Survey : Counting the Cost of Energy Subsidies". International Monetary Fund. Retrieved October 11, 2016. Thomson; Elspeth. The Chinese Coal Industry: An Economic History Routledge 2003 online. Wikimedia Commons has media related to Coal mines in China. China Coal Industry Network - Chinese coal industry's information, policy, science and technology, statistics and other information. Peter Fairley, Technology Review. Part I: China's Coal Future, January 5, 2007. Peter Fairley, Technology Review. Part II: China's Coal Future, January 5, 2007.